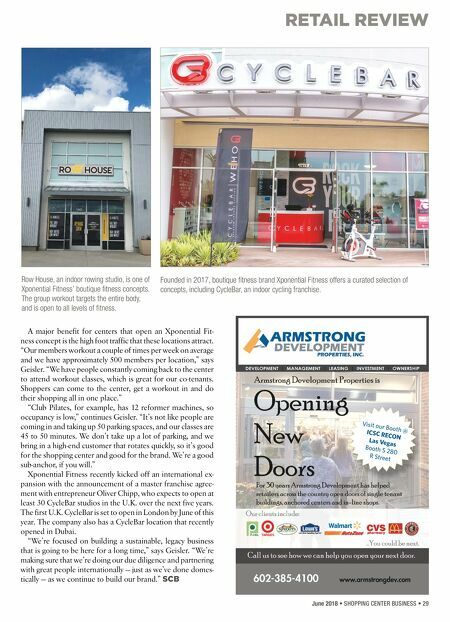 RETAIL REVIEW June 2018 • SHOPPING CENTER BUSINESS • 29 A major benefit for centers that open an Xponential Fit- ness concept is the high foot traffic that these locations attract. "Our members workout a couple of times per week on average and we have approximately 500 members per location," says Geisler. "We have people constantly coming back to the center to attend workout classes, which is great for our co-tenants. Shoppers can come to the center, get a workout in and do their shopping all in one place." "Club Pilates, for example, has 12 reformer machines, so occupancy is low," continues Geisler. "It's not like people are coming in and taking up 50 parking spaces, and our classes are 45 to 50 minutes. We don't take up a lot of parking, and we bring in a high-end customer that rotates quickly, so it's good for the shopping center and good for the brand. We're a good sub-anchor, if you will." 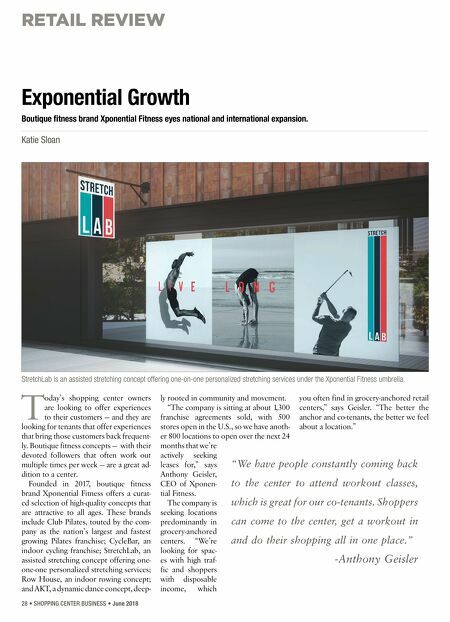 Xponential Fitness recently kicked off an international ex- pansion with the announcement of a master franchise agree- ment with entrepreneur Oliver Chipp, who expects to open at least 30 CycleBar studios in the U.K. over the next five years. The first U.K. CycleBar is set to open in London by June of this year. The company also has a CycleBar location that recently opened in Dubai. "We're focused on building a sustainable, legacy business that is going to be here for a long time," says Geisler. "We're making sure that we're doing our due diligence and partnering with great people internationally — just as we've done domes- tically — as we continue to build our brand." SCB Visit our Booth @ ICSC RECON Las Vegas Booth S 280 R Street Row House, an indoor rowing studio, is one of Xponential Fitness' boutique fitness concepts. The group workout targets the entire body, and is open to all levels of fitness. Founded in 2017, boutique fitness brand Xponential Fitness offers a curated selection of concepts, including CycleBar, an indoor cycling franchise.